St. Joseph Mercy Hospital in Ann Arbor/Ypsilanti, MI is where I used to work. And truth be told, although I have loved every place I have ever worked as a dietitian, St. Joe's was my all-time favorite place to work. So I confess that I may be a bit biased in my enthusiasm with this posting. St. Joe's recently hired a farmer (Dan Bair) to oversee and plan every step of building and planting vegetables in twelve hoop houses (passive solar green houses) on their massive acreage (currently manicured lawns and parking lots but actually former farmland) in order to supply the hospital's food system with organically grown fresh vegetables 12 months of the year plus provide vegetables for a farmers' market in the lobby of the hospital for both staff and visitors. Here is a short video and a local article showing some parts of the building of the first hoop house along with comments from some of St. Joe's staff about why this effort is vitally important for a health care institution to both undertake and embrace. • Economically - If every family in Michigan spends $10 dollars weekly on locally grown foods, it would keep $37 million circulating in Michigan's economy on a weekly basis. That figure will be magnified significantly on a local basis for St. Joe's to be growing its own food! • Environmentally - reducing every square foot of those 'manicured lawns' on the St. Joe's grounds reduces the load of pesticides entering our local watershed. 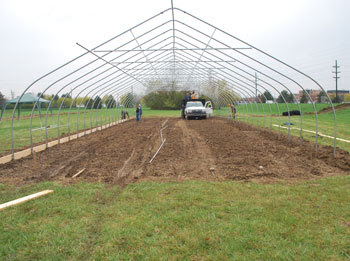 • Socially - my husband was present to get the ends up and plastic over the hoops - think of how a hoop house raising effort brings the community together with a common goal, just like a barn-raising! • Culturally - putting the culture back into agriculture! I have a vision where farmers involved with sustainable agriculture are the 'rock stars' of our society! Please let me know what your local hospital is doing. Is it starting to provide any of its own organically-raised fruits or vegetables? Is it using any of its large grounds to provide for a commuity garden? What wonderful ways to start to the transition from "disease care" to true "health care" for the community it serves by actually appreciating and cultivating the soil literally right under its feet. do for me what I should have done with my own hands. I love what is happening in your part of the world with St. Joe's. How radical and wonderful. I also think that your path is one that many ought to watch and potentially follow. You make Registered Dietitians look really smart. Thanks so much.